K's House Hostel chain was voted the BEST HOSTEL CHAIN WORLDWIDE 2010 & 2011 by Hostelworld.com customers ! We are a modern hostel and all rooms have TV and air-conditioning for free , individual showers with hot water 24hours a day. We also offer a fully equipped kitchen for our guests along with internet access, laundry facility(washing machine and dryer), cozy lounge with big screen TV , free movies ,Japanese style tatami lounge. Hakuba is one of the most popular place in Japan for ski fields ,hiking trails and hot springs(onsen) Our staff speak English and will help you with any travel info. Note : 3 bed private ensuite room is Japanese style room with tatami matt. Our independent cancellation policy will override on website default policy. Please be cautious before booking. about your cancellation or any changes by 7 days before your scheduled arrival. about your cancellation or any changes by 4 days before your scheduled arrival. about your cancellation or any changes by 2 days before your scheduled arrival day or in the event of a 'no show'. *In cases where guests who have booked multiple nights of not show up for their first night and we receive no contact(no-show), the remaining nights will be cancelled and the guest will be charged 100% of the total booking. Beautiful, thank you guys it was a real human experience, thank you (follow me on Instagram Norman Owens) may we meet again! Few minutes walk to Hakuba Goryu. It’s a great place to stay. Toshi is an amazing host. I would highly recommend this hostel. Awesome place! Very accommodating and helpful staff! Staying at Ks House during our Hakuba ski trip was the highlight of our trip! 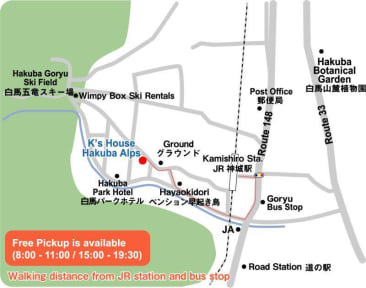 The hostel is centrally located between Kamishiro station and Hakuba Goryu 47 with quite a few yummy restaurants and Onsen around. The hostel hosts, Toshi and his family were welcoming and got us set up with lift tickets, gear rentals, and snowboard lessons. The hostel was clean and tidy and had a room to dry your wet snow gear. We will be sure to visit again! DL: Great place if you want a quieter, clean, comfortable, place you can rest at and get back on the slopes. Not really a party type hostel but, not everyone wants that. The host family is so sweet and helpful. They make you feel like family while you’re there. They asked the whole hostel if anyone wanted to go to 7/11 so we didn’t have to walk and they even drove us to the train station. Make sure to let them know you’re going skiing, since they have a discount coupon. Would go back! I had a great time here! The location is super close to the ski hill, it was only a 10 minute walk up the hill! They also offer you a discount for the rental shop as well as the onsen (which was only a 15 minute walk away). Toshi and his family are super welcoming and kind. Toshi also has a lot of recommendations for places to eat! Overall a great place to stay if you're planning on hitting up the slopes! 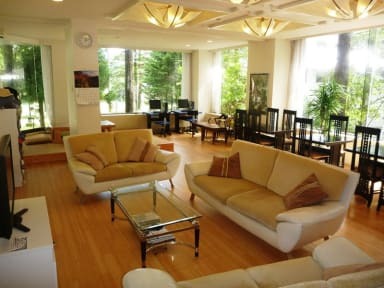 One of the best hostels in Hakuba. It feels like family. Toshi and his family were amazingly helpful and accommodating. Thought they were snobbish at first but it is just there speaking tone. Once you get to talk already, everything is fine. Good place to stay for skiing, but accommodations are pretty basic, even for a hostel. The staff was extremely friendly and even provided us with a ride to the bus station to depart. It is located near a few restaurants and bars, but the immediate area is pretty quiet. Additional showers and more comfortable beds would have been nice.